Hello, I thought these photos would make for a nice discussion. 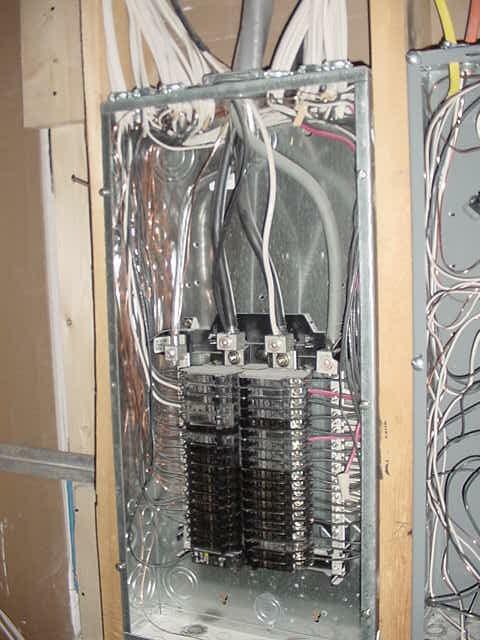 A local contractor (carpenter) likes to do his own wiring to save the homeowners money. This is a sample of his work. What do you think? Not to mention the other problems. Looks like 3-wire service was brought to a subpanel instead of 4 wire. Ground wire being used as a neutral. Undersized horribly. etc etc No disconnect. Actually there's no solid AL, but still major problems. Some things you can't tell from the picks are the "service cable" is 6-2 w/ #10 ground. All breakers are overfused. 14 gauge on 20 amps and 10 gauge on 40 amps. The sub panel main is 100 amp. All neutrals and grounds combined in the sub. For some reason he put noalox on the CU wires. Not pictured are numerous other violations. No GFI's in the wet bar. No crimps or wire nuts on grounds at any device. Wire nuts not tight and wires not pretwisted. This job was a fire waitng to happen. My crew took everything appart and corrected everything they could find. 2 guys were there 6 hours making the corrections. The bad news is this guy has many more projects in the area. We are scheduled to go to another house next week that he worked on. All I know now is the guy's first name, when I find the last name I'm going to tell him to stop wiring or be turned in, I may just turn him in. Must be a carpenter...Look, he didn't want to deface that beautiful framing with romex staples. If this gent has a license (As a Carpenter) he should loose that too, along with some jail time, cause that is just criminal. oh how many times I have seen this, give the customer a price find someone who can do it cheaper (aka your buddy the carpenter of uncle joe) and then viola your back doing a massive repair, service call. Just because somebody wanted to save a dollar, realy worth it right. Wasn't there a commercial a while back for oil filters that said. "Pay me now or pay me later."? At least, you probably won't be electricuted if your filter fails. 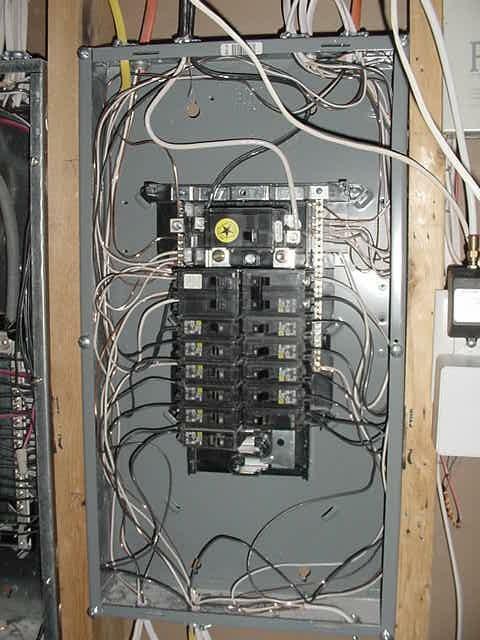 what a hack it is clear that this person has no knowledge of electrical wiring practics. or just doesnot care. he should be turned in and beat down for this. 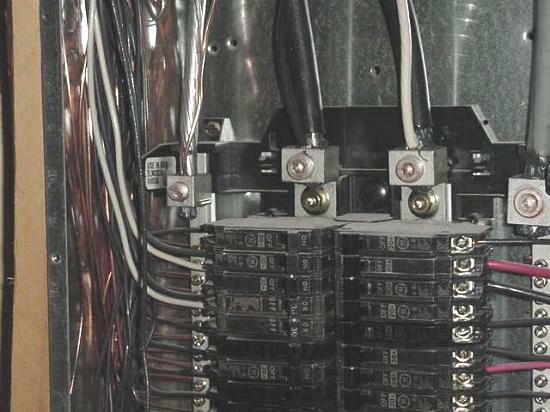 is the second pic panel over loaded looks like more than 40 breakers in that pabel. what about each wire having a connector where it enters the panel. Considering the home-owner has to hire an electrician to CLEAN UP the carpenter's mess, how is that saving someone money? I'm not an electrician, but even I could wire a panel in a much neater way than this clown!! Some people should just stick with hammering wood together and leave the playing-with-wires to those who know what they're doing. 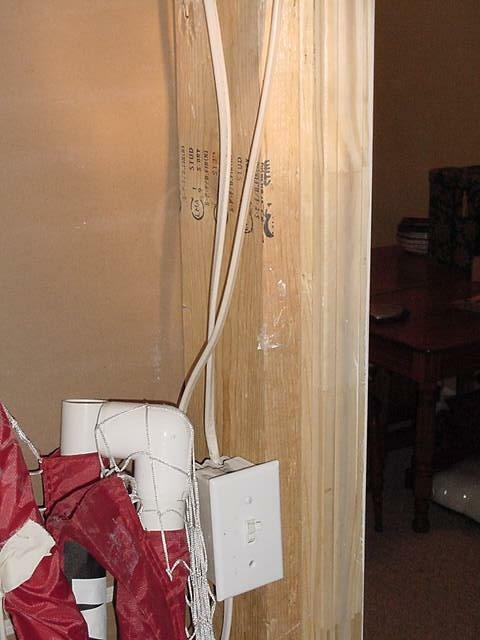 Also, in one of those pictures, it looks like he used those half-sized circuit breakers. I thought those things aren't supposed to be used anymore. Actually, that is the original panel and they are GE slim line breakers. While not my personal choice, they are perfectly legal. However, this hack did put a Sq D Homeline breaker in that GE panel which I don't believe is classified to be there.